Lagos Elementary School partners with Virco PlanSCAPE to furnish their new STEM elementary school. Lagos Elementary School in Manor, Texas, takes a hands-on, 21st-century approach to educating kindergarten through fifth-grade students. Designed and built as a New Tech campus, the school is the first in the state to offer a dedicated STEM education—science, technology, engineering and math—at the elementary level. 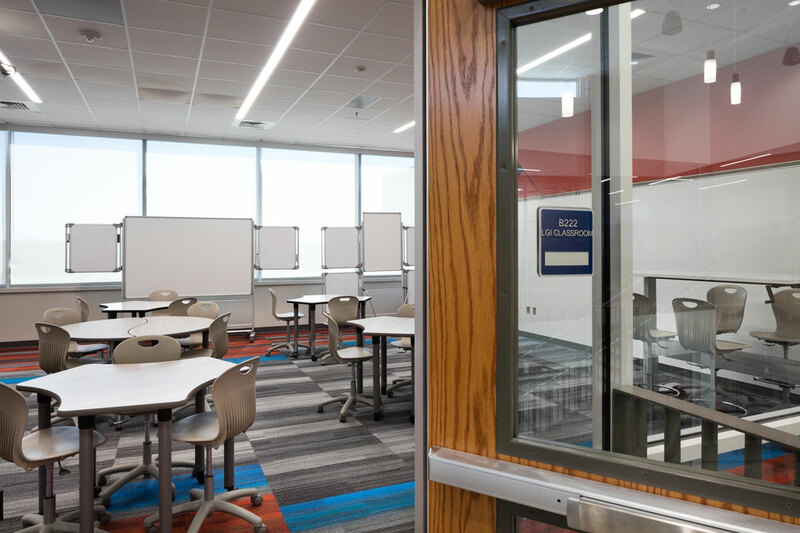 In outfitting this innovative campus, school officials wanted flexible spaces with durable furnishings that would promote group collaboration and active project-based learning. Virco’s PlanSCAPE delivered with a mix of customized solutions. The superintendent at Lagos Elementary School had a vision for this school. Instead of traditional classrooms where students sit in rows facing the front and focus is placed on the teacher instead of the students, he wanted a dynamic layout that allowed children to face each other as they worked collaboratively in small groups. He also wanted teachers to empower their students by working within the classrooms, facilitating problem solving and providing input. To accomplish this goal, Virco’s PlanSCAPE team passed on traditional teacher’s desks in favor of smaller scale desks with moveable lecterns that allow instructors to move about various areas in the classroom. Classrooms were installed with an assortment of desks that could be nestled together for group collaboration, as well as moveable chairs, activity tables, stand-up workstations and upholstered ottomans accented in the school’s official colors. And to further promote group interaction during lunch breaks, the classroom concept was carried into a “flexible cafeteria,” with café-style tables and chairs, mobile tables and stand-up height tables that allow students the option to sit down or stand up. Second- through fifth-grade classrooms were equipped with Stand-Up Height Cafe Table, Activity Tables with Dry Erase Boards, Rocking Chairs and Moveable Ottomans. Flower-shaped and kidney-shaped tables assist guided activities and provide a place for teachers to sit down and interact with students. 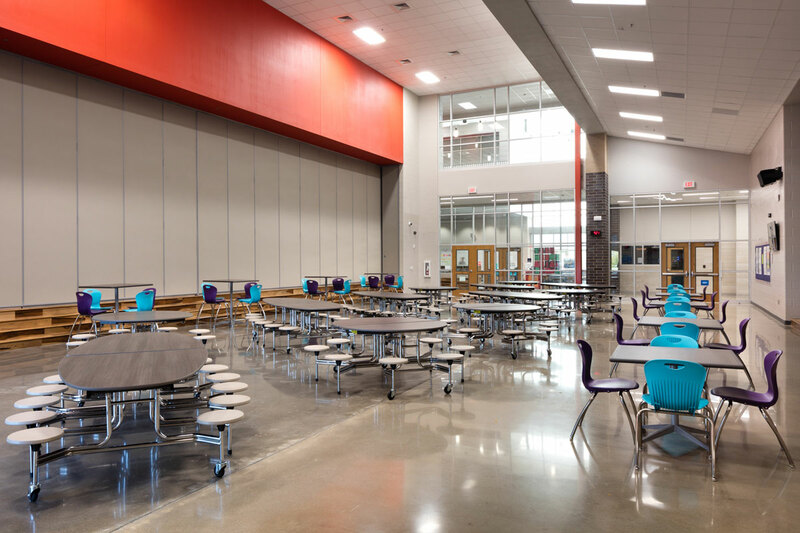 To promote interaction among the students, Virco’s PlanSCAPE pulled concepts from the classroom design and created a “flexible cafeteria,” with café tables and chairs, mobile tables and stand-up height tables. With student activities during the day and parent-teacher events in the evening, it was important that this space could be quickly and easily reconfigured without calling in a custodian. PlanSCAPE provided the solution with moveable S-Shaped Bookshelves, Activity Tables and Marker Boards on casters that allowed a variety of student learning zones, including “Campfire” spaces for lectures, “Cave” spaces for independent learning and “Watering Hole” spaces for group learning.